Established in May, 2008, Shandong Jurun Building Materials Co.,Ltd. is a branch of Shandong Tiexiong Xinsha Energy Co., Ltd., covering the area of 1,000 mu. 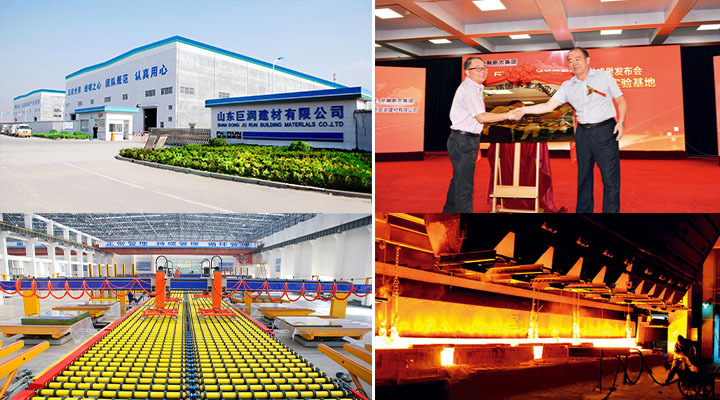 Its registered capital reaches 742 million yuan and the company owns 1,200 staffs, with annual output of highly qualified float glass standing at 21 million weight cases, which contributes to the annual output value of 1.1 billion yuan. It has set up four production lines with 700 tons of highly qualified float glass each day. Its technical arrangement has been leading the domestic field. It mainly produces highly qualified float glass with the thickness of 3mm-19mm. Its products are sold to Shandong, Jiangsu, Anhui, Zhejiang, and Henan and so on, as well as countries and regions in the Middle East and Eurasian. Products are widely used in construction, automotive, decoration and deep processing, and other fields. In 2015 with the technological innovation, the company created the mirror-level sheet glass of 3mm, 3.2mm to increase the market specifications supporting capacity and broaden the sales channels, and keep product quality continuously improved. Beginning in 2016, the company had arranged four production lines to be cold-repaired, upgraded one by one. After that, its production capacity increased to 830 d/t. The company attaches great importance to technology research and development, and institutes own advanced laboratories with the Technology Development Section, with which the State Key Laboratory of special glass jointly makes research and development of other special glass and new building materials. The company adheres to the scientific development, environmental management, energy saving and emission reduction, comprehensive utilization of resources and so on. In order to make its soot emission meet the national regulatory requirements, it invested 50 million yuan to construct four high-temperature electrostatic precipitator and denitrification device; the waste heat is used to generate power and can save 30,000 tons of standard coal every year, the annual generating capacity is 50 million degrees, and the annual economic benefits reach 20 million yuan. The company gained the certification of quality management system, energy management system, occupational health and safety management system and environmental management system. It has repeatedly won honorary titles like: "harmonious enterprise", "Advanced Enterprise Safety Production " and "top 100 enterprises in Heze City," awarded by Heze City and Juye County’s government.